The Master of Science in Textile Chemistry degree program emphasizes the fundamental principles of polymer science, dyeing and finishing technology, color science, dye chemistry, and fiber formation. Our program is highly relevant to many of the chemical, retail and textile industries, as well as environmental, medical and forensic science. The Master of Science in Textiles (MS) prepares students for industry positions. Students interested in continuing with a Ph.D. in Textile Technology and Management (TTM) or Fiber and Polymer Science (FPS) are also encouraged to pursue the M.S. degree. The M.S. degree requires a minimum of 35 hours including a thesis and typically takes 2 years to complete. 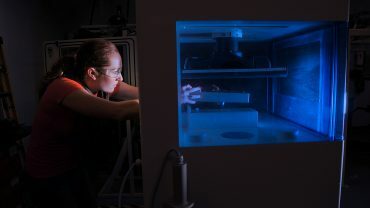 Graduates of Textile Chemistry are recruited by a broad range of companies, such as DuPont, Proctor & Gamble, Nike, General Motors, fiber and textile companies all over the globe, and state and federal agencies involved with forensic science. A growing number of off-campus professionals from around the world have shown interest in studying for a Master of Science in Textile Chemistry online. 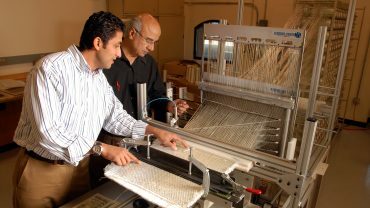 Candidates with a bachelor's degree in textiles, or in a related area, may apply to the master's program. This master's degree requires 35 credits. At 2018-19 tuition rates, the cost of the required graduate courses is $453 per credit for North Carolina residents and $1,261 per credit for non-residents. Thus, the total estimated cost for the program is $15,855 for North Carolina residents and $44,135 for non-residents. See Online and Distance Education Tuition and Fees for cost details. Students are held to the same requirements as the on-campus M.S. in Textile Chemistry (Option B), and must follow the rules outlined in the Graduate School Administrative Handbook. This degree program is particularly attractive to those who have an undergraduate degree along with some professional experience. Graduates with a Master of Science in Textile Chemistry find employment in textile, chemical, and retail industries as well as in environmental and medical science. They are recruited by a broad range of companies, such as DuPont, Proctor & Gamble, Nike, General Motors, and even law enforcement for forensic science work. The degree also provides a firm foundation for further graduate studies. The Textile Engineering, Chemistry and Science (TECS) Department grants an MS TC (Option B) degree to students who fulfill the 35-hour course work requirements in textile chemistry. Students enrolled in this program must develop a Plan of Graduate Work under the direction of his or her TC faculty advisor. At least six (6) courses from the following list of approved TC courses. Substitutions must be approved by the Director of Graduate Programs. Industrially important textile chemicals used for enhancing fiber and fabric properties such as durable press, water repellency, anti-soiling, flame retardancy, softness, stiffness, lubricity and other uses. Correlation of effect with structure, end-use influences, interaction with fabric and fibers, sources and synthetic routes, economic and environmental considerations. Principles of step reaction and addition polymerizations; copolymerization; emulsion polymerization; ionic polymerization; characterization of polymers; molecular structure and properties. Poly[olefins], poly[vinyl chloride], poly[vinyl acetate], poly[urethanes], epoxies, silicones, styrene copolymers used as textile finishes, nonwoven binders, fabric coatings, composites, adhesives, foams, carpet backing adhesives. Emphasis upon synthesis, industrial processes, properties and products. New or special course on developments in textile engineering and science. Specific topics and prerequisites identified vary. Generally used for first offering of a new course. Practical and theoretical analysis of the chemical and physical principles underlying conventional methods of converting bulk polymer to fiber; rheology; melt, dry and wet polymer extrusion; fiber drawing; heat setting; general theory applied to unit processes. Mechanisms of dyeing. Application of thermodynamics to dyeing systems. Kinetics of diffusion in dyeing processes. Basis of modern techniques for color specification, measurement, control and communication. Applications of color science to textiles, plastics, color reproduction, computer-based imaging and display systems. Basic concepts taught by computer color graphics. Correlation of color and chemical constitution, synthetic routes for popular dyes of all important types; electronic mechanisms for reactive dyes; chemistry of dye interactions with light, washing and other in-use influences; economic and environmental considerations. Exploration of connections between microstructures and properties of polymers afforded by analysis of their conformational characteristics. Analysis of NMR spectroscopy and conformational energy estimates to establish polymer microstructures and resultant sizes and shapes of polymer chains, which then related to their unique and rich variety of physical properties. Intensive treatments of selected topics in textile, polymer and fiber science. Study of selected topics of particular interest in various advanced phases of fiber science. In-depth study of the engineering design of biomedical polymers and implants. Polymeric biomaterials, including polymer synthesis and structure, polymer properties as related to designing orthopedic and vascular grafts. Designing textile products as biomaterials including surface modification and characterization techniques. Bioresorbable polymers. Art and science of light and electron microscopy; theoretical and practical aspects of visibility, resolution and contrast. Laboratory practice in assembling, testing and using various microscopes and accessories in analyzing, describing and identifying unoriented and oriented crystalline or amorphous materials. Laboratory emphasis on study of fibers and polymers through transmission microscopy with polarized light. Theories, experimental evidence and characterization methods of the molecular fine structure of fiber forming polymers in the solid state. Characterization methods include X-ray diffraction, microscopy, infrared, thermal and magnetic resonance. Independent Study credit hours will not be included as part of the coursework. Discussion of scientific articles and presentations; review and discussion of student papers and research problems. Graduate programs that are to be earned totally through Textiles Online Programs (TOP) are designed for maximum flexibility. Please note that not all courses are offered every semester, and may be cancelled due to low student enrollment. Not all courses listed in the NC State Course Catalog can be provided through TOP.